Let’s face it. Faces matter. But why must they matter so much? The actor Renee Zellweger is facing the music because her face looks different. This has ignited a bonfire of speculation about whether she had “work” done; Ms. Zellwegger indicates that her changed look reflects nothing more than a healthy change in her lifestyle. Jennifer Gerson Uffalossy of The Guardian doesn’t wonder what is wrong with Ms. Zellweger’s appearance, but rather what is wrong with us for making such a big deal of it. Good question. Steve Rose suggests that a performer’s face can be his or her brand. Consumers expect predictability about brands. We want that boxed cereal to taste exactly the same every time we eat it. So, generally speaking, by branding actors’ faces, it suggests that those faces mustn’t change. The only problem with this is that human beings are designed to shift and morph. Change is a biological imperative. The world marches on. And the passage of time is etched into our souls and onto our faces. I’m on the brandwagon about this celebrity issue because branding performers bothers me in certain contexts. Expecting actors to remain youthful and unchanging saturates society with a desire to freeze the world at the age of 26. The personal and societal consequences of this addiction to perpetual youth, not to mention Photoshopped standards of beauty, has been expressed a thousand times over. The fountain of youth is an unattainable holy grail that distracts us from what is really important. We all know that. But branding does something more. It can handcuff performing artists by preventing them from exploring new terrain and growing their art. I know a marvelous storyteller who shares funny tales about his life as a kid. He performs semi-regularly at a particular storytelling festival. One year, he told a serious, long form story about an important historical figure. Though it was a beautifully crafted piece with golden thematic threads linking past and present, the audience didn’t accept it. They couldn’t hear it for the art it was. Not because it wasn’t good, but because it wasn’t his brand. His trademark goofball antics (aka “LOL” moments) were not part of that piece. The storyteller was stuck with his brand, whether he liked it or not. A humorist doing drama? It takes time for audiences to warm up to that, if they accept it at all. Audiences are powerful. That is why artists strive to connect with their audience. But here is the heart of my concern: Do artists connect to audiences as brands or as people? Can artists be authentic if they are hog-tied to a brand? It is certainly true that branding is important in business. And the performing arts are a business. Still, while branding can help a performing artist connect with the right audiences, it can also be limiting. Creativity needs to exist outside the box, inside the box, without the box, and anywhere else it wants to be. If branding locks people up in a box, creativity may not thrive. And if artists are hampered, then what they bring to their audiences suffers. Whether people are celebrities or not, we can applaud the changes that life brings instead of sniggering at them. We can fashion brands for performing artists that incorporate change as part of the brand, so that life and artistic transformations are anticipated and appreciated. Even though the arts are a product and art is a business, artists are not boxes of cereal. The signature of the arts is growth, development, and change. If artists don’t try new things, their work suffers. So does art. Branding can stifle creativity. It certainly caused quite an uproar when one woman was altered by time, surgery, or lifestyle changes. Let’s allow Ms. Zellweger, other performing artists, and everyone else to be who they need to be. There’s no need to brand them like cattle. We can remain open to what they have to offer. There is beauty in change and delicious depth in the lines that mark the passage of time. C’mon society! Let’s do an about face and applaud for that. Branding is a hot topic (no pun intended). I was recently on a Twitter chat with independent artists. The topic of branding came up and it sparked a lively debate. What do you think? How do we brand performing artists? Should the arts be branded at all? Any artists out there with an opinion on this? Love to have a conversation…share your thoughts in the comment box down below. Stories have always been important to human beings. Ancient people painted story pictures on cave walls. They carved stories in stone. But just when and how did oral storytelling take place? People have long thought that some of it occurred around the campfire or hearth. Michael Balter, writing for Science Magazine, reports that recent research suggests that the campfire setting sparked the human storytelling impulse. By studying an African hunter-gatherer tribe that only recently settled down to agricultural, village life, anthropologist Polly Wiessner noted different styles of narrative communication among them. It all depended on when and where tales were told.. During the day, stories were more likely to be about topics like economics and land issues. But as days stretched into evenings by the fire, people’s talk turned to social institutions, people in other communities, and traditions. Storytelling is the oldest form of social networking. The idea that the campfire setting is an incubator for stories won’t surprise campers and counselors. Countless imaginations (and marshmallows) sizzle while listening to ghost stories around a fire. That age-old human tendency to enjoy stories in the evening continues even today. We attend theatrical shows at night, we sit around supper tables telling each other about school or work, and we share bedtime stories with our children. It is an iconic, romantic image – people sitting around a fire listening to stories. It is also now documented that language-rich worlds are kindled by the warmth and glow of a fire. As a performer who has told stories in every context imaginable, from campfires to hospitals and parking lots, I would like to offer an additional insight. 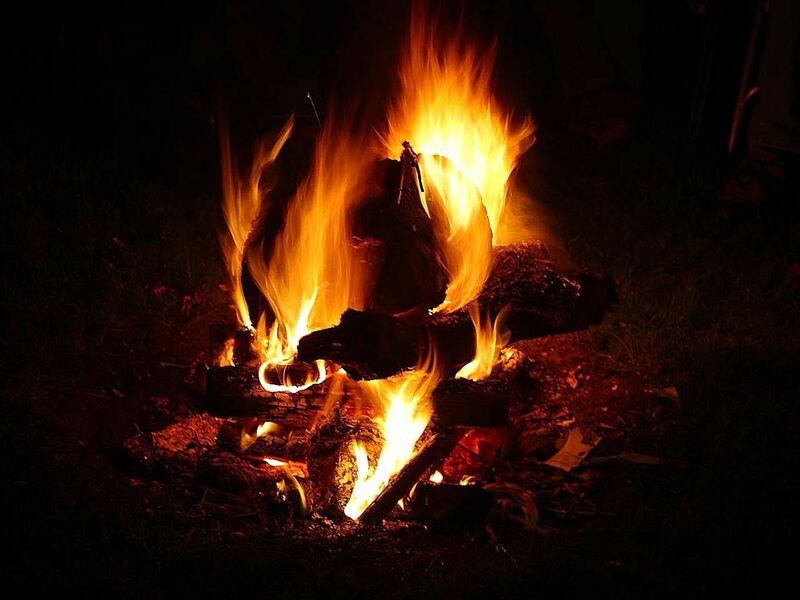 The intimacy and sweetness of the campfire setting, combined with the full-bodied, live presence of a campfire audience, gives storytellers and listeners the focus and comfort that can set everyone’s imagination on fire. There is nothing like an in-tune, authentic audience for encouraging communication and creativity. That said, I will keep this topic in mind the next time I struggle with writing. Perhaps the darkness of night and the roar of a fire can help to burn my writer’s block to ash so that creativity, like a phoenix, can rise. It’s worth a try, at any rate! And then there is that other night light that connects us to stories. It is a cooler light. A bluer light. A light that brings us stories of friends on social media and makes it possible for us to binge on Netflix. Is this screen-based, mediated connection to stories an outgrowth of storytelling around the fire? Does it inspire connectivity and imagination and sustain the storytelling impulse? Or is this storytelling of a different kind? Let’s chat this up! If you are new to this blog, welcome! 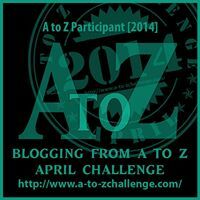 For my Blogging from A to Z April Challenge, I am writing about how storytellers, writers, parents, teachers (in other words, just about anyone) can reimagine beauty to be more inclusive. That way, people with disabilities, varying body types and racial backgrounds, etc. (in other words, anyone) can feel and be recognized by the world as the beauties they truly are. The elegant, creative solution to a problem is simply beautiful. When all the stressful puzzle pieces fall into place and pesky problems depart, life is awash in unadulterated loveliness. “Wouldn’t it be loverly” if such a skill could be bottled and handed out as swag at every library, school, and therapist’s office? The creative spirit – inventiveness – is beautiful. Who turns lemons into lemonade? Who transforms rags into a glamorous wardrobe? Who cause colors to spring to life on canvases? Who can invent, dream up, hatch, concoct, fabricate, make, start up, birth? The people who harbor the muse of inventiveness, that’s who! And they are beautiful. Think about any story of any type. Tales turn on a problem, conflict or dilemma that a protagonist faces. From superheroes to princesses to angry housewives to your 7th grade teacher, if they are in a story, they have to solve or overcome something. And there is beauty is in the solution. Maybe a completely creative, impulsive fix; perhaps it is a carefully devised, thoughtful solution. The point is that removing obstacles usually takes more than luck. It takes originality interwoven with brainpower, a teaspoon of the inspiration, which is then kneaded to perfection with experience. And the more unusual the solution, the more beautiful. If you are writing or telling a story, any character can take a moment to reflect on the action of another. Characters can respond directly to others with compliments about another’s beauty because of a breathtakingly beautiful solution to a predicament. When we create something new and different, people take notice. We are drawn to new things. Think about it. Don’t most people turn their heads when a baby is in the room? Though we love familiarity and ritual, we also love what is fresh and move forward with the new and the creative. Inventiveness is a term that encompasses solutions of the mind and heart. It connotes science, humanities, and the arts. Inventive people are creative; creative people are inventive. Honor the dream weavers for the beauty they hold within. Characters whom you tell and write about: fictional ones, real ones, true to life ones, can be described by their creative approach to the world. No matter what we look like, we are all great beauties during moments of inventiveness. What people or characters that you know or have written/told about are beautiful for their inventiveness? Copyright 2014 The Storycrafters. All rights reserved.